I use the word “explosive” both figuratively and literally. On our first evening there, we found ourselves on Sixth Street— the city’s glittering nightlife strip— where we promptly gravitated towards the Iron Cactus Bar. Sitting out on the rooftop patio, my dining companions and I ordered up a magnificent parade of Tex-Mex goodness, washed down with robust Patrón margaritas aplenty. The deceptively simple lobster tacos, in particular, were absolutely mind-blowing: seasoned in a tangy tequila-spiked marinade, then charred to perfection over an open-flame grill, chunks of lobster provided sublime sweetness to the warm floury pockets stuffed full with Monterrey jack cheese, pico de gallo and beans. Waking up the next morning with niggling hangovers, we stumbled across town to the vast State Capitol Building, where we half-heartedly pretended to marvel at the architecture before hastily taking shelter in the shade of an Italian restaurant, Quattro Gatti. The impepata di cozze— Prince Edward Island mussels lightly steamed in their own juices— was a breath of fresh sea air in landlocked Austin, which made me wonder why some Bay Area restaurants can’t even cobble together seafood dishes half as decent. The pizza ai funghi was similarly remarkable, with a layer of velvety baby ’bellos infused with white truffles, then blanketed in mozzarella di bufala and oven-fired to crispness. We discovered after lunch that wandering around the streets of downtown Austin on a quiet weekend is surprisingly charming, and the perfect balm for our overblown nerves. Later on as the sun dipped, we forwent a proper dinner in favor of barhopping. That is another story unto itself, but what proceeded was a night of debauchery, of which all I have are hazy memories of men in leotards, $2 Jaegerbombs, and stripper cages. 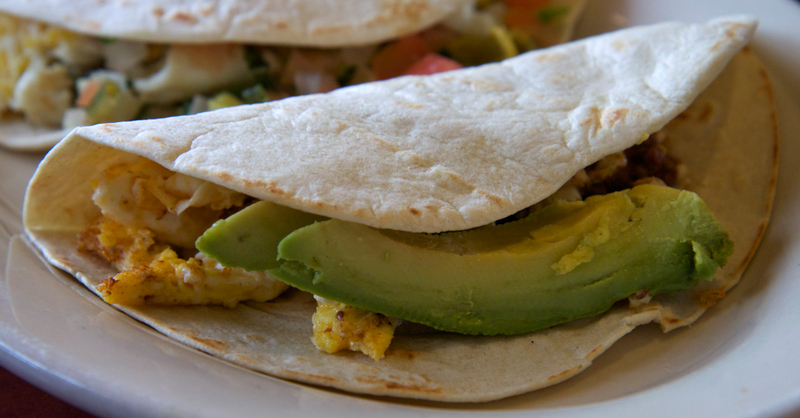 The next morning, seeking relief from our new-and-improved hangovers (everything in Texas is bigger, after all), we tasted an Austin institution, breakfast tacos. For that we hiked along an interstate highway for a blinding eternity, before reaching the Holy Grail that is Tex-Mex Joe’s. At $2 a pop, each breakfast taco was an entirely customizable semicircle of hangover heaven, and I lassoed together chorizo, egg, nopalito and avocado. The result was an unimaginable detonation of flavors in my mouth: the whisky spirits were instantly warded off. On our last evening, we gravitated back to Sixth Street— this time at Parkside, a shining bastion of elegance amidst a riotous sea of neon tequila bars. We ordered an oyster platter, with more varieties than you ever care to know about, from the clean, mineral flavors of the freshwater Rappahannock to the lascivious unctuousness of the Cotuit. As I obscenely tongued my last mollusk, my dayboat scallops arrived— still sizzling— with a river of red curry paste snaking across the plate, providing a piquant counterbalance to the shellfish’s richness. On my dining companion’s plate, the lone star was a formidable hunk of pan-seared rabbit, which is everything a meat should be (and then some). Afterward, I ran into Shawn Cirkiel, Parkside’s restaurateur-chef. When I told him how impressed I was with his dishes, he cited— in true Austinite fashion— his muses as “the weird and the wonderful of this crazy city.” Between the tattooed grannies and the chatty backseat hobos on the buses, I couldn’t agree more. As evidenced by this trip, the most important criteria when picking your travel compañeros is that they share your gastronomic proclivities. Had my friends not wanted to hike across town for a meal, and had they not wanted to share plates to taste more dishes, and had they not wanted to eat at local restaurants instead of at Chipotle— well, let’s just say I probably wouldn’t be back on speaking terms with that one friend of mine. Contact Renjie Wong at renjie “at” stanford.edu.